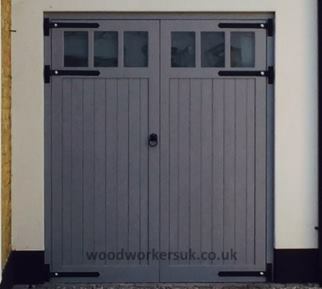 So, what do you get if you cross our popular Conway garage doors with our equally popular Aber garage doors…? Neither; you get the Aberconway, with its three perfectly placed glazing panels in the top section of the doors. When two sublime doors collide…this is the result; just magical! Like our Aber doors, the Aberconway garage doors are perfect if you want a bit more privacy than what the Conway, Elwy or Brenig doors allow, yet they still allow beautiful natural light to flood into your garage! Who could ask for more? Our Aberconway garage doors, shown above in Idigbo (Hardwood). Rear view of our Aberconway garage doors, again in Idigbo (Hardwood). Please click the picture above for a larger image. Mortice and tenon jointed? You betcha, and the tenons go right the way through and are secured by wedges and boat-building glue; you don’t get more secure than that! Boarding jointed into all rails for longer life – Yep! Made to the sizes YOU require? Yes sir! Why go anywhere else when we cater for YOUR needs? 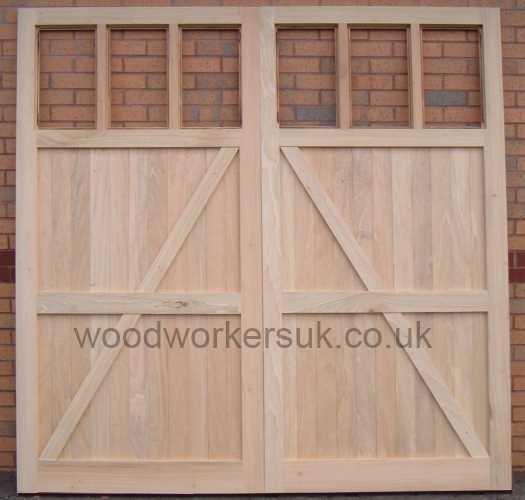 Rebated meeting stiles – (the garage doors overlap when closed). Pre-beaded internally – The Aberconway is supplied pre-beaded ready for glazing. 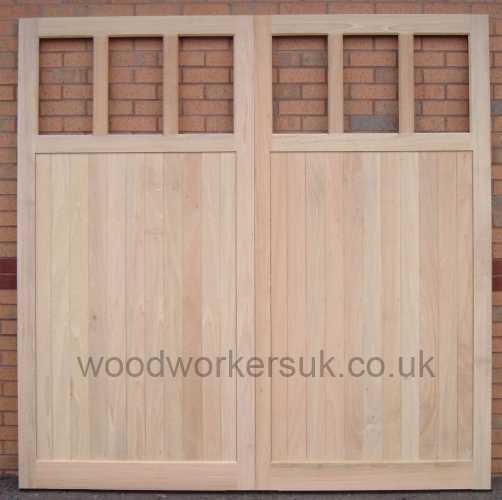 The Aberconway guide prices are based on a pair of doors 6ft 6 high x 6ft 6 overall wide (approx 1980mm high x 1980mm), these are NOT from prices, smaller doors will be more economical etc – contact us for a price! All prices are correct time of insertion and are EX VAT. Free delivery to most parts of the UK mainland is included – exclusions do apply, again please contact us. To get a personalised costing on our Aberconway garage doors please use the form below.